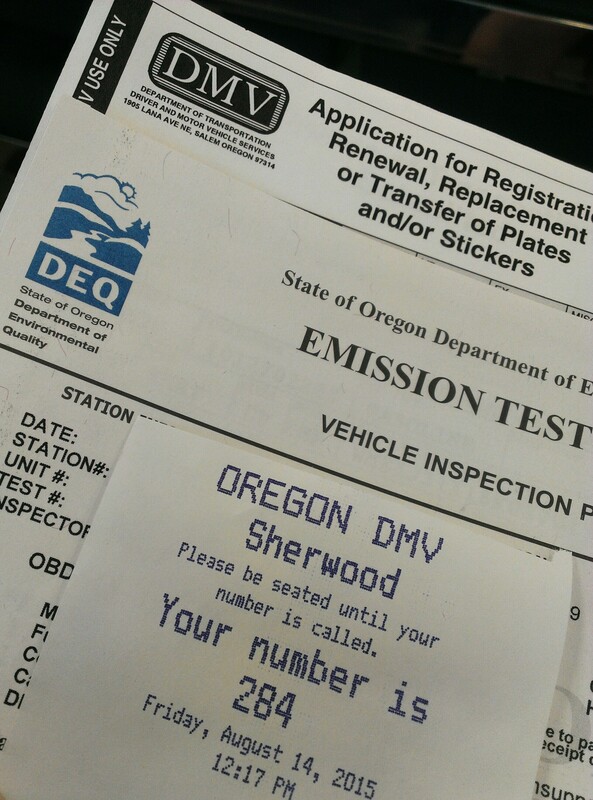 DEQ DMV « Phloggings will continue until morale improves…. I’ve had my Smart car for 5 years & 40,000 miles. It is impossible now to remember why or how it ended up without a front license plate after all this time. The lack of front license plate has only ever been annoying when parking within 4 blocks of Powell’s Books in Portland. It is within those few city blocks that I have received the most parking tickets of my life. The street parking monitors in those 4 blocks are the most vigilant & ruthless of any I have ever experienced. I will decline to note the number of parking tickets, but the last time this happened I had two citations on my windshield at the same time. One for lack of a front license plate & another for the time running out on my paid parking slip by 10 minutes. Never again! This has caused more stress in my life & more arguments with my Bear Face than I will ever confess. Never again! The Smart failed the DEQ (Oregon Department of Environmental Quality) test last week due to the check engine light, which was on because the fuel sensor (thingy) wasn’t mixing air/gas appropriately. The dealership offered to fix that for $800. Instead we took it to a local mechanic (recommended by dear friends Matt & Jenny Davis) & he fixed it for $292.70. I took it back to the DEQ today & it passed! On to the DMV. At the DMV there was no reception person to help with confusing DMV forms & nor to give helpful directions. Fortunately I was prepared with the forms from a previous visit (4 months ago). I printed my number 284 & then automatically glanced up to the big red numbers indicating the next number they were going to call. 241. I always take my journal with me to the DMV, but sadly I’d picked my camera today over my journal. I need a bag that carries both. My birthday is coming up…. Speaking of coming up, after 50 minutes double checking my forms, making sure my checkbook was ready (no debit cards allowed), various people sitting too close & being forced to overhear several ridiculous conversations (“It was a school bus, then my Uncle converted it to an RV”) it was time for 284! The woman who called my number was of a Grandmother age with what I will broadly assume was a Russian accent. During our time together she noted that my tags had expired in May & I, making excuses, claimed it was because I’d been out of the country. It was true that I had been out of the country, but not for 3 months. Continuing to help me she exclaims, “How nice for you!” & tells me about her daughter who has offered to take her on a trip out of the country, but that it probably wouldn’t happen because of education costs. She said, “It has always been my dream that my kids & grandkids be honest & go to college. I only wanted them to be honest & go to college. I think that dream is fulfilled, my Granddaughter goes to college this year.” I probably could have stood there for the next hour chatting with her over the DMV counter about anything, but suddenly it was all over. I had new plates & tags in hand & I was walking out the door. After 1.5 hours of my life $131.00 (DEQ $21, DMV $24 new plates, DMV $86 for 2 year registration) of my money I am finally a law abiding citizen! Jazmyne Walton: I love talking to people with different accents. One time this spanish woman asked me about an ingredient in a lotion that I had no idea about. We were both standing in the facial care aisle of Walmart staring at the vast quantity of products, I felt overwhelmed and she seemed indecisive. I told her we could look the ingredient up on my phone and then I read her the description. She thanked me and asked me if she could do it on her phone. She pulled out an iPhone and I taught her how to go to the Internet, but only use it without WiFi if it’s an emergency or if you know you have enough data. Then we talked about learning new languages and how she speaks spanish but is learning french and the best way to learn a new language is to find a song you like and learn the words, then the translation. Which immediately made me think of your Portuguese butterfly song. We talked for at least half an hour and parted ways with her clasping my hands and telling me to learn all the languages I’d like. Seeing the good side of a bad experience!